Actor Rishi Kapoor is currently in the US undergoing treatment for his ailment. His wife Neetu Kapoor is along with her husband and they have rented an Apartment there. 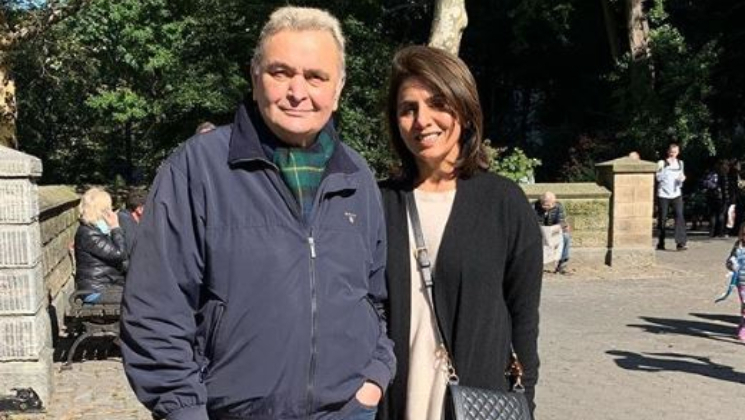 Today, Mrs Kapoor shared a picture along with her husband Rishi Kapoor where we can see beautiful orange, yellow, red and pink flowers in the background. Have a look at the picture and we are sure it will make your morning shine brighter. Veteran actor Rishi Kapoor went for the treatment last month along with his wife and son Ranbir Kapoor. The actor himself took to his social media handle sharing the news that he is taking a leave of absence from work to seek treatment. He had also requested his fans to not speculate or worry about him. Also earlier this month, she posted a photo of their son Ranbir and captioned it ‘The strength’ with a heart emoji in it. The actor or their family haven’t yet revealed anything about the ailment of Rishi Kapoor. Recently, Priyanka Chopra, Sonali Bendre and Anupam Chopra paid a visit to the actor. Some days back, Rishi Kapoor had shared a slow-motion video of him taking a stroll with Anupam Kher in New York City. We wish a speedy recovery for the actor.